Introducing the Aqua Swim and Spa exercise pools and spas. Outdoor Sports now carries this versatile line of exercise pools that can easily compete in price and quality to other swim in place products. We personally endorse this line and use it for fitness, physical therapy and rehabilitation and family fun. Conventional swimming, aqua aerobics, water walking and mild to advanced exercise levels are accommodated by the Aqua Swim Spa. Different family members can use the pool for their specific fitness needs, from rehabilitation and physical therapy to those who want to maintain a high fitness level through swimming or aqua aerobics. The pool is available in different sizes, with or without the attached spa, and has depth options which are critical to rehabilitation and aqua aerobic users. 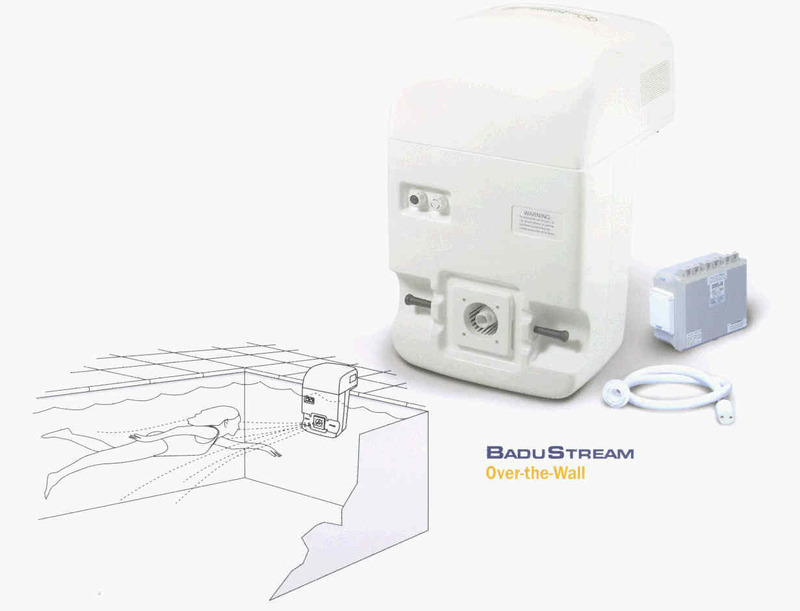 We also sell systems which allow you to modify your existing pools (AquaSwimJet, BaduJet and BaduStream). Outdoor Sports is also a distributor of Speck Pumps, filters and other accessories. Benefits: These Spas provide all the benefits and functions of a full-sized pool and spa at a fraction of the cost. They take less space, less water, less chemicals, less energy for heat and operation. Fitness Swimming: The Swim Spa exercise pool uses strong jets to create a current which duplicates a river current. The current and the amount of air injected are adjustable to suit variety of needs. Conventional strokes are easy to perform in the current, as shown by the image above. Freestyle is especially suited for this current. And, by adjusting the current you will find an increased work out as compared to standard pools, and no need for flip turns. Health: This pool is wonderful for hydrotherapy, hydro massage, physical therapy and rehabilitation. By reducing gravity, aquatic exercise offers a method to exercise by minimizing the impact on bones and joints. For those with injuries, arthritis, spinal disorders and many other conditions, aquatic exercise can be the safest means of mild exercise, muscle toning and strengthening, and rehabilitation. Aqua Aerobics: The current provides a new element for aqua aerobic exercisers. Using the current while performing standard aqua aerobic movements increases the force of the water on the muscles. A light to intense jog against the current can provide aerobic benefit. Specific moves can be used against the current to tone muscles. It is recommended that the water level be at about breast level, and this pool offers different depths to accommodate this. This pool provides many options for an aquatic exercise program. You can use your webbed gloves and floating weights to add to the resistance in the current. And, remember to add music to your work out! Water Walking and Physical Therapy: Water walkers can use the pool with or without the current. Using the current on the low setting and performing low impact moves, or use the pool in a regimen designed by a physical therapist to increase quality of your life. Again, water depth is important in supporting the body during exercise. Spa Combinations: To add warm jet therapy to your exercise pool is easy with Aqua Spa. You can chose different configurations to fit your space requirements. Space Saving: For many of us who have wanted a pool but don't have the space, the Swim Spa is the answer. It comes in various dimensions to fit small yards, decks, rooms and even garages. Cost Savings: The pool is priced to be affordable. Less pool space and water means less energy costs, less chemicals and less maintenance. In colder climates, an enclosure over the pool allows year around swimming and cost savings on heating bills. Installation Support: We have first hand knowledge of the installation process and will assist you with technical support to get your swimming fast. We can give you installation expertise that can't be duplicated by any other competitors. Hydro-Fit Exercise Equipment: We carry the full line of Hydro-Fit equipment. Complete details provided in the associated page. You will enjoy using your Aqua Swim Spa every day just as we do!